Two-Factor Authentication (2FA) for extending the security of enterprise authentication processes, ensuring peace of mind for your customers’ and employees’ sensitive data. And a Password Manager to securely manage all corporate passwords. Get Started FREE versions of every PasswordWrench product. Start now and upgrade at any time. 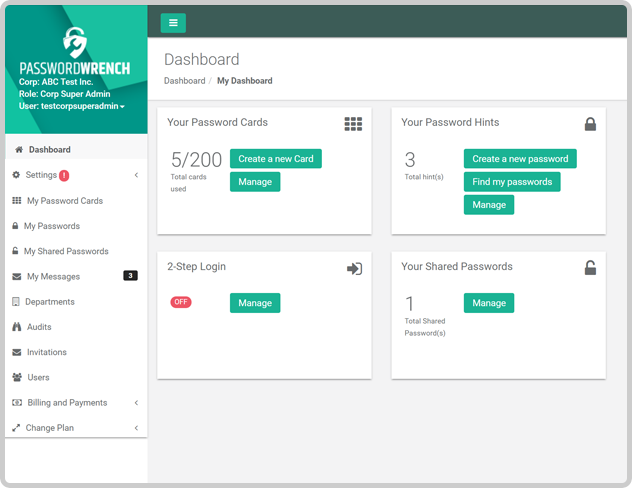 PasswordWrench offers cutting-edge dual authentication and password management for businesses of every size. Easy to use. Easy to manage. Provide Two-Factor Authentication within your applications* at a low cost. PasswordWrench’s 2FA solution’s elegant simplicity ensures a higher user adoption rate, requiring less training. This means fewer support calls, and increased security across your enterprise. Our 2FA could be used as the sole 2FA or stacked onto an existing 2FA/MFA authentication process as a fail-over. Software to help manage your organization and users’ complex passwords. Matches any system’s requirements with ease and without forcing users to disclose their passwords. We do not record passwords, or even ask users to reveal their passwords. The only way to keep passwords secure is when no one else knows your passwords other than the system to which you are authenticating. Your passwords are safe and remain secret. 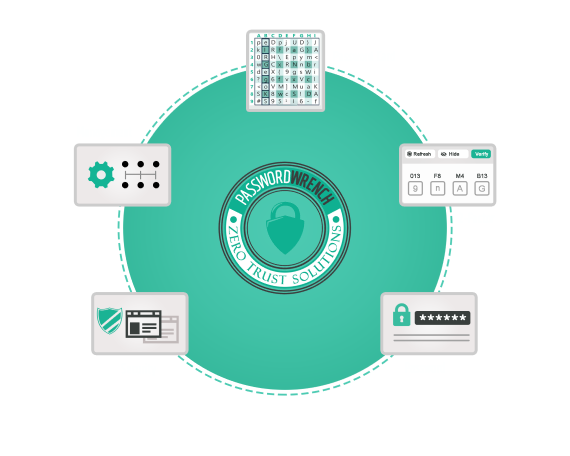 PasswordWrench provides the only password manager that does not compromise passwords. With our easy-to-use and easy-to-integrate Two-Factor Authentication (2FA) there is no need to use SMS or digital pins devices any longer. Our solutions provides the best of both worlds: the ability to be both more secure and more effective. Replaceable any time; no delay and no costs. Eliminates most type of attacks such as MITM (“man in the middle” attacks). Safer and more effective than competitors. The most flexible 2FA system available. Easy to deploy; increase adoption and decrease support calls. One solution that works for everybody. Stand-alone 2FA or fail-over for existing 2FA/MFAs. 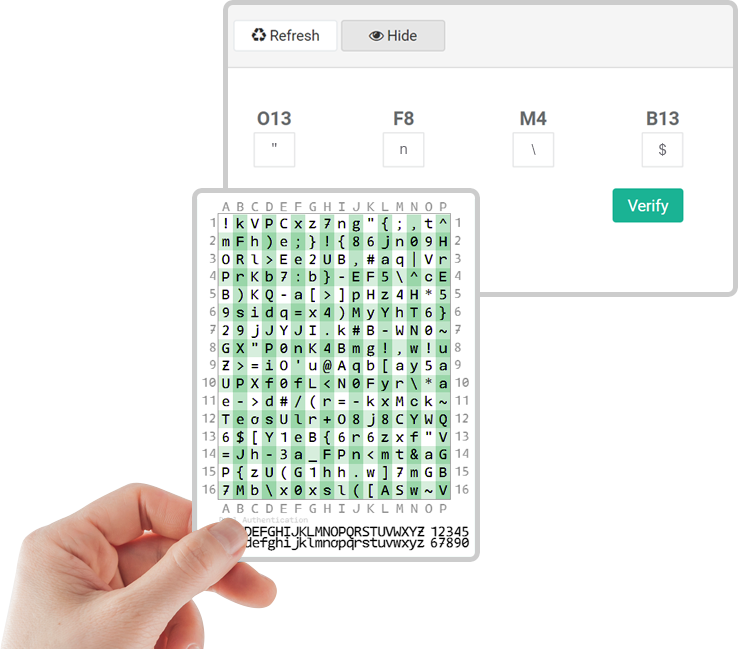 Our Password Manager lets all enterprise employees manage their passwords in one central place, without the need to install any applications. It helps manage your company’s 2-Factor Authentication access as well. Save money and time while keeping your business data secure, and the hackers at bay. Online tool - no downloads minimize security risks as there’s no software to install. Available anywhere and on any device with a modern browser. Protect you against spyware, hidden cameras, passersby, keyboard stroke recorders, etc. Manage Password Cards for our 2-Factor Authentication. Share passwords with your colleagues. Manage users within your organization. Configurable Security & Rules Policies. PasswordWrench's password manager is the best solution to share logins with contractors & consultants with ease. In addition, we needed a 2FA that works for all of our customers that is simple to use, and they provided both. Jeffrey Idso, CEO & President, CoachList, Inc.